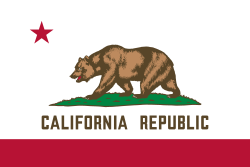 California (/ˌkælᵻˈfɔːrnjə/ KAL-ə-FORN-yə, /ˌkælᵻˈfɔːrniə/ KAL-ə-FAWR-nee-ə) is the most populous state in the United States and the third most extensive by area. 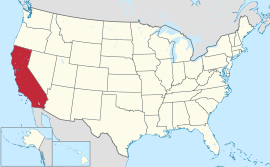 Located on the western (Pacific Ocean) coast of the U.S., California is bordered by the other U.S. states of Oregon, Nevada, and Arizona and shares an international border with the Mexican state of Baja California. The state capital is Sacramento. Los Angeles is California's most populous city, and the country's second largest after New York City. The state also has the nation's most populous county, Los Angeles County, and its largest county by area, San Bernardino County. What is now California was first settled by various Native American tribes before being explored by a number of European expeditions during the 16th and 17th centuries. The Spanish Empire then claimed it as part of Alta California in their New Spain colony. The area became a part of Mexico in 1821 following its successful war for independence, but was ceded to the United States in 1848 after the Mexican–American War. 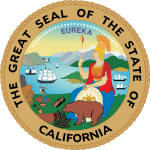 The western portion of Alta California then was organized as the State of California, and admitted as the 31st state on September 9, 1850. The California Gold Rush starting in 1848 led to dramatic social and demographic changes, with large-scale emigration from the east and abroad with an accompanying economic boom. If it were a country, California would be the 6th largest economy in the world and the 35th most populous. It is also regarded as a global trendsetter in both popular culture and politics, and is the birthplace of the film industry, the hippie counterculture, the Internet, and the personal computer, among others. Fifty-eight percent of the state's economy is centered on finance, government, real estate services, technology, and professional, scientific and technical business services. The San Francisco Bay Area has the nation's highest median household income by metropolitan area, and is the headquarters of three of the world's largest 20 firms by revenue, Chevron, Apple, and McKesson. Although it accounts for only 1.5 percent of the state's economy, California's agriculture industry has the highest output of any U.S. state.